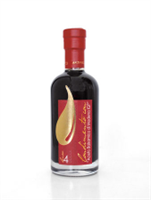 Gocce 4 is made by methods that have been part of Reggiano tradition for many centuries using a select blend of the finest cooked musts and excellent wine vinegars. Grapes are harvested in late autumn at the time when sugar content reaches its peak, then after pressing the must is cooked slowly for many hours over a moderate flame. Aged for years in casks made from noble woods, it acquires an exquisite aroma and exhilarating taste. COLOR - Deep, lustrous black, intense and with great character. AROMA - A complex bouquet, persistent aroma, with a pronounced balsamic note, harmoniously balanced with fruity nuances. FLAVOR - A broad, complex structure, with a robust and harmonious, round and mature taste. ACCOMPANIMENTS - Ideal as a condiment for fresh salads, raw and grilled vegetables. Excellent on risottos and first course dishes with vegetable sauces. Enhances the taste of roasts. Superb accompaniment to both fresh and seasoned cheeses. The smooth taste goes well with desserts, custard and ice creams. Only a few drops will add zest to fresh fruit salads. Gocce Linea 12 is a delicious condiment with low acidity. It is made according to ancient methods of Modena tradition, starting with a clever blend of the best cooked musts and excellent wine vinegars and integrated with the best aged "Aceto Balsamico di Modena". The harvest is carried out in late autumn when the sugar level reaches its peak. The cooking of the must is slow, prolonged, with moderate heat, and according to the rites of our tradition. This specialty is characterized by the prevalence of soft and sweet concentrated grape must which gives the product a sweet and enveloping smooth taste. Long aged in wood barrels, it has exquisite taste and intoxicating fragrance. COLOR - Jet black and shiny, the tone is deep and thick. AROMA - The bouquet is complex and lingering, accented with balsamic notes in harmony with balance and a clear perception of fruity scents. ACCOMPANIMENTS - It is the ideal accompaniment to the whole meal, finding great applications on all dishes. Nice on salads, dips and grilled vegetables. Excellent on pasta dishes and risotto. Its intense and lasting taste enhances the flavor of roasts. Superb accompaniment to both fresh and seasoned cheeses. The smooth taste goes well with desserts, custard and ice creams. Only a few drops will add zest to fresh fruit salads.